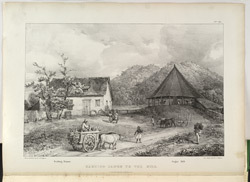 Illustration of work taking place on St Clair Farm, a sugar plantation on the island of Trinidad in the early 19th century. The sugar canes have been cut down by field gangs and are now being transported to the mills in carts drawn by oxen and mules. Mills in Trinidad at this time could be powered by water, wind or animals, and to the right of this picture, in the covered shed, oxen can be seen turning the mill. In the mills the juice was squeezed from the canes as they were passed through large rollers. There is a simple diagram of the working of these rollers at the bottom of the accompanying page.